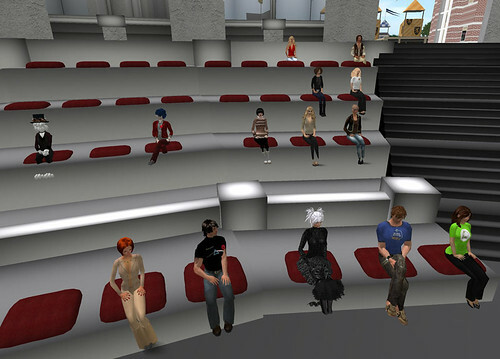 AJ Kelton, founder of the VWER, just announced the group's new home: a four-region minigrid set up by Reaction Grid. The technology will permit those with avatars in OpenSim grids that permit hypergridding to teleport to meetings and events. You can also read Maria Korolov's coverage of the group's move here. I'm most excited about expanding my own knowledge of running an OpenSim server, since it's a goal I have, long-term, for my university. The VWER membership has sufficient skills to build what we'll need for this new grid. It will be considerable: making a meeting place, designing scripted objects, even pimping our avatars that are "native" to the new mini-grid. Why is all of this important? The group's move signals that yet another educational group (like colleagues in New Zealand and at Clemson) have branched out to a technology superior to Second Life's closed universe. We have more control when we own or manage the technology of our builds, including region back-ups that resemble the ways we retain data for all of the other work we do outside virtual worlds. Essentially this is an evolutionary move, not a revolution. Many members thought we were leaving SL, which isn't at all true. As long as that grid exists, VWER will meet there, though the price-hikes mean that our current home will vanish in May. The group's next step in SL will be to find a new home on that grid. Lalo Telling once quipped that we may come to see SL as "the old country" from which we immigrated. I'm not sanguine about the future of walled-garden grids in general or SL in particular, but I will always feel fondness for SL. Personal note: the last two weeks marked the first time I'd spent more time--a lot more time, actually--in OpenSim than in SL.